The Chicago ‘L’ system has long been the way tourists and locals alike have travelled miles across the city, whether it be to Wrigley Field or downtown for work. Since 1999, there’s also been another use for the elevated tracks: as a way to learn about Chicago’s rich history. 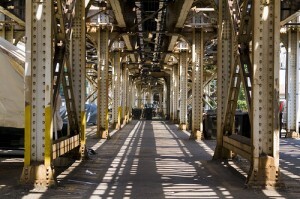 Chicago-L.org hosts tours via the ‘L’ tracks through various institutions, including the Chicago History Museum and the Chicago Architecture Foundation. No matter what the tour or what ‘L’ line your guide will take you on, each tour offers tidbits of history and architecture lessons as you ride the city’s public transportation system. While tour fares typically aren’t expensive (usually around $11-$16, and that includes the ‘L’ pass), be prepared to walk.